The Thirty Two Timba snowboard boots are packed with features that ensure a snug fit for lasting comfort on the hill. The phylon midsole offers stability and support, and the System G2 full-length gel insert absorbs shocks in rough terrain. The Inner Ankle Harness ensures a lock down fit that won''t come loose with intense riding. The three-part Intuition liner wraps snugly around the foot without constricting. 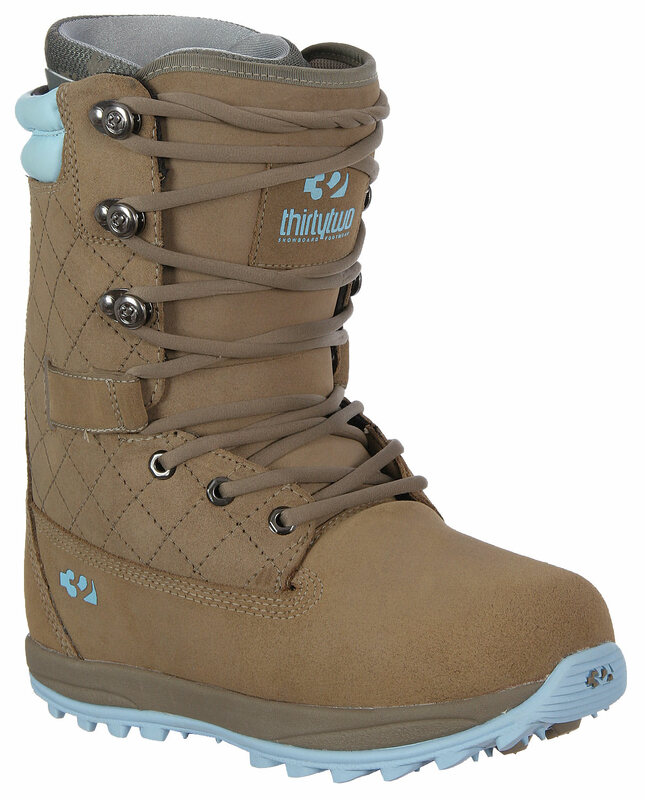 Get quality, comfort, and durable performance with the Thirty Two Timba snowboard boots. Dual durometer (35 / 45) phylon midsole for dampening, variable support and stability. System G2 full-length gel insert for maximum protection. Ultra-low profile 400 NBS rubber outsole for improved board feel and response. POST Hardware for easy tightening and ease of tension. Inner Ankle Harness for improved ankle support. Added O-Rings and Finger Pull Tab make for friction-free lacing. Ankle Tongue Tension System for secure mid-boot tightening. Three-part Intuition liner with dual-density Ultralon foam, high-density outer foam with ultra-density inner foam for added comfort and warmth closer to foot. Symmetrical eyestay stabilizer for added response and support. Achilles Pinch Pads for optimal heel hold. Removable Velcro closure at cuff. Split tongue design to improve symmetrical fit over instep and ease of entry. Agion anti-microbial coating to eliminate odor. Stitchless interior to eliminate any pressure points. Here at the House talkin' about playin' with the best deals I have on snowboard boots in store. 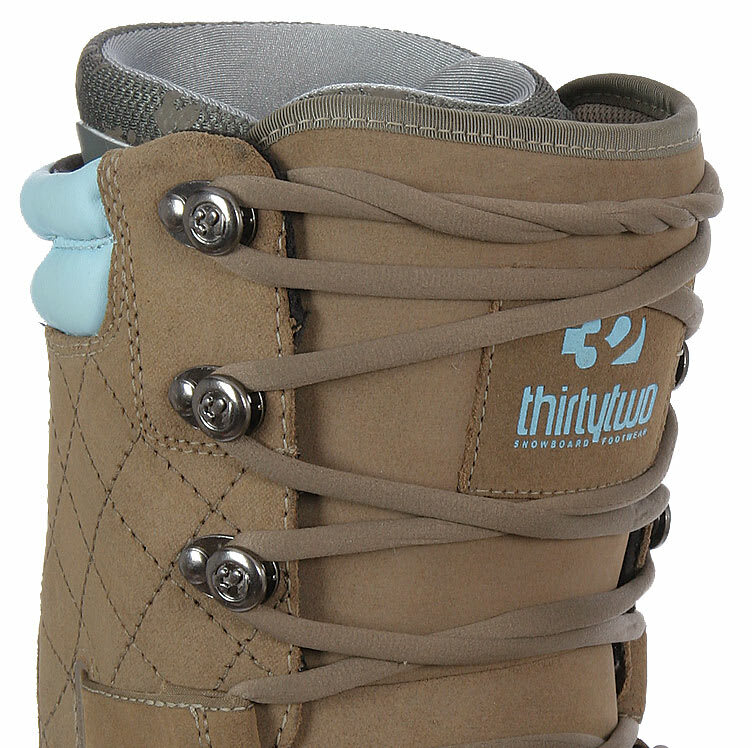 It's a Thirty Two Timba snowboard boot.Â�Obviously, designed to kind of resemble a Timberland by just a little bit. What a lot of people don't know though is its not just the style on this one.Â�This is actually a really high-end freestlye snowboard boot from them. What you're looking at starting with the liner, we got a Level 3 Intuition Liner. Same line you find in the Lashed snowboard boot, the Prospect, some of the best-lined snowboard boots in their line. Extremely light-weight talking grams on this one for sure. Does have some energy panels built into it to maintain the flex on it. The big thing about these liners though is that they're designed to custom-mold to your foot. Just by wearing them around or by putting on the heat towers in the shop. It's gonna pick up all your ankle structure, your toes, your arch and the bottom as well too. The Thirty Two liners are really good versus other heat-molded liners. There's hardly any seams that actually touch your foot making it extremely comfortable even before you mold them. The liner itself well see some deep achilles pockets in the back it goes only get pronounced as it molds to your foot. Top has a power-strapped closure and this one doesn't have laces in the liner it has them on the interior of the snowboard boot.Â�Lace harness will actually hold the liner and the foot into the back of the snowboard boot obviously giving you really, really good heel hold. The Timba also has a pretty cool feature, it is the tongue tensioner. That's nice. Anyway, the in-step leads comes through this little loop which actually comes back and connects to the tongue. So as you lace it up, it pulls the tongue back against the leg giving you a really good seal against your leg. Some snowboard boots you could see the gaps and stuff like that, this one doesn't do that. It's really, really good at holding the tongue in. Other than that, you get synthetic New Buck construction. It's gonna be water-proof. I was thinking it'd look like these suede in these other Timberland snowboard boots. It's got a nicely padded cuff also once again mimicking the look of the Timberlands. From there, we do have mostly rubber sole, really good grip. Does have the hardened ice spikes. It's really good for hiking the pipe. Really good for any kind of backcountry stuff. snowboard boot really can do it all. The flex of it is definitely in the middle of the road. 1 being soft, 10 being stiff. I'd say it's gonna be around a 4 or 5. 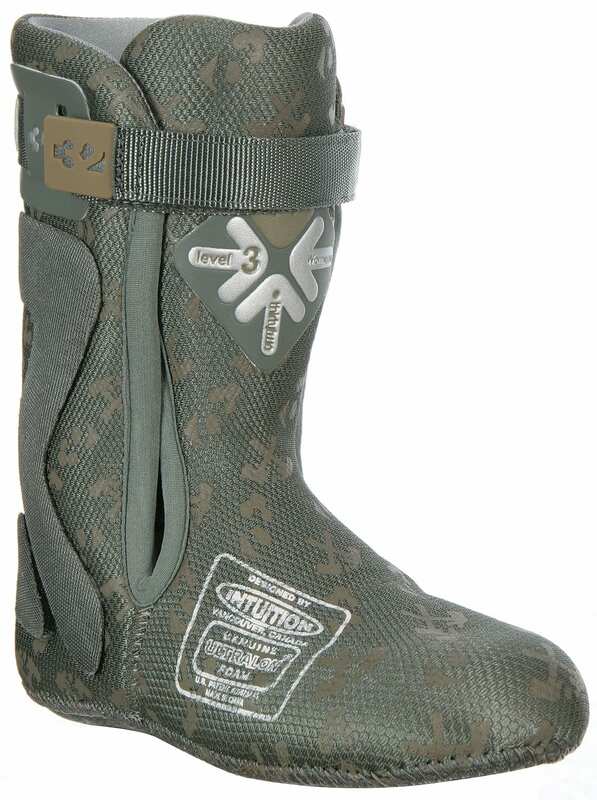 I tend to some... more to people looking for a really, really comfortable freestyle snowboard boot. It is, in my opinion, one of the 3 most comfortable snowboard boots we have in the store and like I said it has really got a sick price on 'em. On liner snowboard boots, being the most important part of the package, this is one way to get a really good snowboard boot at a cheap price. 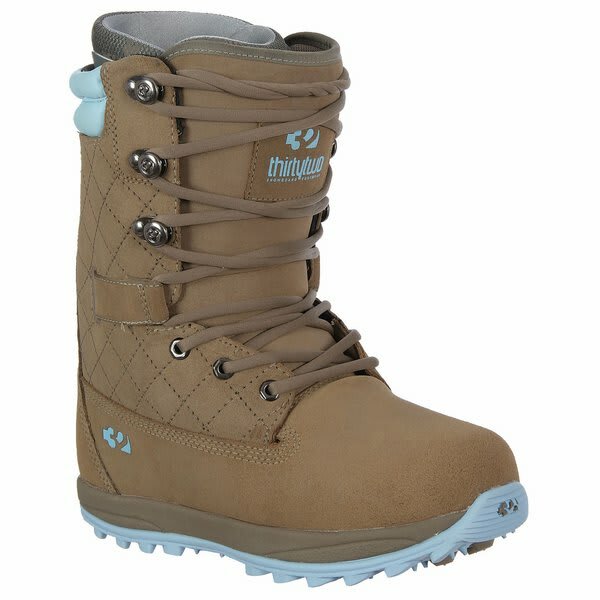 The Thirty Two Timba snowboard boot.